Neapolitan cuisine has many dishes identified with one festival or another, which in the past were made only then. Carnival lasagna, struffoli was made at Christmas. 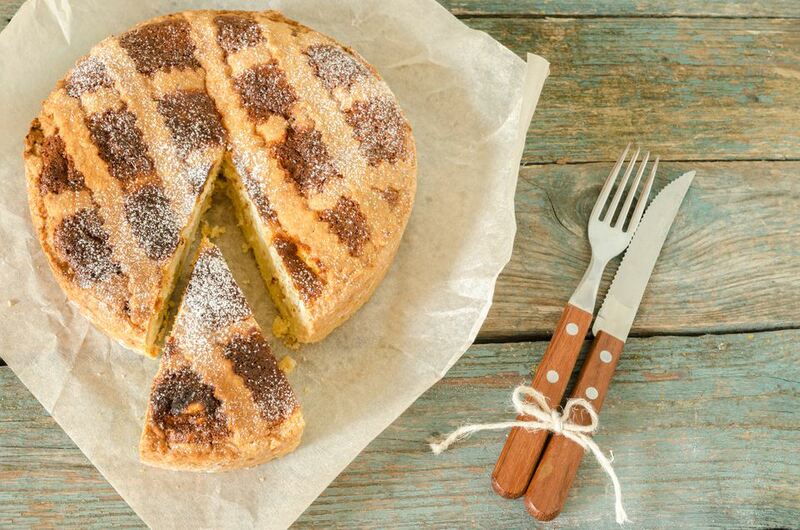 There are several Easter pastries, the most important of which is the pastiera—a centuries-old dish that appears in innumerable versions, each made according to a closely guarded family recipe. The major variations are in the amount of orange blossom water, a non-alcoholic essence (if you cannot find it, use orange extract) and the use of crema pasticcera (pastry cream), which some families include and others do not. It also requires presoaked grain, which takes a time to prepare (Neapolitan delicatessens now sell canned presoaked grain). To start from scratch, purchase 1/2 pound whole grain and soak it in cold water for 2 weeks, changing the water every 2 days (another suggestion is soaking the grain for 3 days, changing water daily). Come cooking time, drain it and cook the amount indicated. The pastiera is traditionally served in a 10-inch diameter round metal pan with a two-inch rim; Neapolitan pastry shops sell the pastiera in the pan and it is presented so at even the most elegant table. Pastiera Napoletana is a miracle dish, born of the arrival in the port of a grain ship during the famine. The people were so hungry they threw the grain directly into the pot rather than grind it and bake bread. It's fitting that it now be used to celebrate Easter. Should Pastiera require more time than you have, you could make an easier, faster, crust-free version or try migliaccio, another Neapolitan Eastertime dessert made with ricotta cheese, semolina flour, and lemons. Begin the day ahead by cooking the soaked grain with the milk, zest, lard, sugar and vanilla over an extremely low flame for at least 4 hours, or until the grains come apart and the milk has been absorbed so that the mixture is dense and creamy. The next morning make the pie crust. Make a mound of flour, scoop a well in the middle, and fill it with the lard, sugar, and yolks. Use a fork or pastry cutter to combine the ingredients, handling the dough as little as possible (don't knead it). Once you have obtained a uniform dough press it into a ball and cover it with a damp cloth. Pass the ricotta through a strainer into a large bowl, stir in the 3/4 cup sugar, and continue stirring for 5 to 6 minutes. Next, stir in the yolks, one at a time, and the grain. Next, add the orange water; begin with half the amount and taste. Add more if you would like it stronger, keeping in mind that the aroma will fade some in baking. Stir in the cinnamon and the candied fruit as well. Then whip the whites to soft peaks and fold them in. Roll out 2/3 of the pastry dough and line the pan. Fill it with the filling. Next, roll out the remaining dough and cut it into strips, which you will want to lay across the filling in a diagonal pattern (lift them from the pastry cloth with a long spatula to keep them from breaking). Bake in a moderately hot oven (370 F or 180 C) for 1 hour or slightly longer. The filling should dry almost completely and firm up, while the pie crust should brown lightly. Serve the pie in its pan, and continue to enjoy it over the next few days for breakfast.